HONG KONG (Reuters) - McDonald's Corp (MCD.N) has agreed to sell the bulk of its China and Hong Kong business to state-backed conglomerate CITIC Ltd <0267.HK> and Carlyle Group LP (CG.O) for up to $2.1 billion, seeking to expand rapidly without using much of its own capital. The 20-year deal caps months of negotiations between the fast-food chain, private equity firms including Carlyle and TPG Capital Management LP [TPG.UL] as well as several Chinese suitors. The U.S. fast food chain said local partners will help speed up growth in the world's No. 2 economy through new restaurant openings, particularly in smaller cities that are expected to benefit from increased urbanization and income growth. "McDonald's globally overall is struggling and didn't have the money or intellectual resources to focus on China," said Shaun Rein, managing director at China Market Research Group. The company has more than 2,400 restaurants in mainland China and roughly 240 in Hong Kong. The new partnership plans to add 1,500 in the two areas over the next five years. Under the deal, Hong Kong-listed CITIC Ltd will own about 32 percent of the business, with CITIC Capital, an affiliate company that manages private equity funds and other alternative assets, holding another 20 percent. Carlyle will control 28 percent of the business, while McDonald's will retain a 20 percent stake, the companies said in a statement. The deal will be settled in cash and in shares in the new company that will act as the master franchisee for the 20-year period. McDonald's originally wanted to raise up to $3 billion from the sale of the business, but later decided to keep a minority stake to benefit from exposure to future growth in China, a person with direct knowledge of the plans previously told Reuters. The partnership will also aim to boost sales at existing restaurants, with menu innovation a key focus. 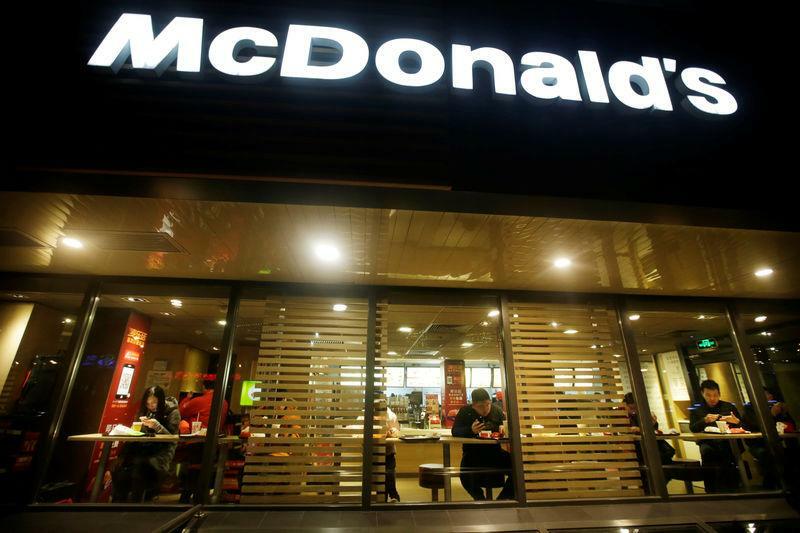 Fast-food firms including McDonald's and Yum Brands Inc (YUM.N) are recovering from a series of food-supply scandals in China that have undermined their performance. "I'm not sure how much more you can do with McDonald's in China. They're a well-run company, so I'm not sure that CITIC and Carlyle are able to add that much more aside from capital," Rein said. McDonald's said in March it was reorganizing operations in the region, looking for strategic partners in China, Hong Kong and South Korea. The company later decided to keep its South Korea business. Other companies that had bid for the China and Hong Kong assets included TPG, which teamed up with mini-market operator Wumart Stores Inc, and real estate firm Sanpower Group Co Ltd [SPGCL.UL], which owns British department store House of Fraser Ltd [HFPLC.UL], sources have said. JPMorgan Securities is advising the buyer group, while CITIC Ltd also said it hired CITIC CLSA Capital Markets as its financial adviser and CITIC Securities as financial adviser in China. McDonald's hired Morgan Stanley (MS.N) to run the sale. In investment management, we've posted very strong investment results, particularly in private real assets and private equity. Across the board, ROE, ROTCE, the Firm efficiency ratio and wealth management margin are in line with or at the higher end of our strategic objectives, ensuring a very solid start of the year. Consistent with our objective to invest for growth, we announced our intent to acquire Solium Capital, a leading global software provider for equity administration, financial reporting and compliance. The shares of Altria Group Inc (NYSE:MO) are lower today, after U.S. Senate Majority Leader Mitch McConnell of Kentucky announced plans to introduce a bill in May to raise the minimum tobacco-buying age to 21. Against this backdrop, eleventh-hour option bears are speculating on more downside ahead of a historically bullish week for MO shares. Altria stock has explored a bigger-than-usual range of roughly 3 points today, and earlier breached its lower Bollinger Band for the first time since January. Sleep Number reported first-quarter sales that fell short of analyst expectations. The mattress maker's stock tumbled nearly 19% in Thursday afternoon trading. Shares of Sleep Number SNBR were down as much as 19% on Thursday afternoon, a day after reporting first-quarter sales that fell short of analyst expectations. Living to 100 is a blessing, if you can afford it. Financial experts around the country say Americans need to save hundreds of thousands, if not millions, of dollars for retirement, but much less of that conversation revolves around spending down that money — or stretching it to meet your lifespan and beyond. “You have to worry about getting unlucky and living to 100,” said Richard Thaler, a Nobel Prize winner in economics, during a Brookings Institution event Thursday. Today we will run through one way of estimating the intrinsic value of Tiffany & Co. (NYSE:TIF) by taking the expected future cash flows and discounting them to their present value. This is done using the Discounted Cash Flow (DCF) model. We generally believe that a company's value is the present value of all of the cash it will generate in the future. Today we are going to look at Chico's FAS, Inc. (NYSE:CHS) to see whether it might be an attractive investment prospect. Specifically, we'll consider its Return On Capital Employed (ROCE), since that will give us an insight into how efficiently the business can generate profits from the capital it requires. Firstly, we'll go over how we calculate ROCE. Tesla is expected to report first-quarter results next Wednesday, April 24, with Wall Street bracing for a loss following two quarters of profits and hoping for better news on production and demand. The timing of the report is on the early side for Tesla, which typically reports its first-quarter numbers in early May, and it comes as the stock has been under pressure following a first-quarter delivery miss earlier this month. The report is also scheduled for release two days before an event aimed at showcasing Tesla's autonomous driving capabilities. So what Skechers reported first-quarter revenue of $1.28 billion, up 2.1% year over year and $20 million below the average analyst estimate. Currency was a big problem during the quarter, knocking down sales by more than three percentage points. Adjusted for currency, Skechers' revenue rose 5.2%. It was March 2018, and once more Bill Gates found himself behind a podium. Now the world's second-richest man and foremost itinerant advocate for the poor was in Abuja, Nigeria, talking about the same theme that had underlain all of these speeches: the need to invest in “human capital.” Among those gathered at the conference center, in the shadow of the Aso Rock Presidential Villa, was the Nigerian President himself, Muhammadu Buhari, and what seemed like the entire seat of government, from legislative mandarins to a full house of governors and business leaders—all primed to hear from a man who had, so far, lavished the country with $1.6 billion in grants through his eponymous foundation. Two months earlier, the Bill & Melinda Gates Foundation had taken the unusual step of absorbing a $76 million IOU Nigeria owed to Japan, for money Nigeria had borrowed to fund a polio eradication effort. Steve Berglund has been the CEO of Trimble Inc. (NASDAQ:TRMB) since 1999. First, this article will compare CEO compensation with compensation at other large companies. At the time of writing our data says that Trimble Inc. has a market cap of US$10b, and is paying total annual CEO compensation of US$11m.